At the inaugural USC Virtual Technologies for Health Symposium, more than 90 Trojans from across the university convened in real life for a day focused on virtual reality technologies and their clinical applications for improving the health of people with disabling conditions such as stroke, Alzheimer’s disease and Parkinson’s disease. 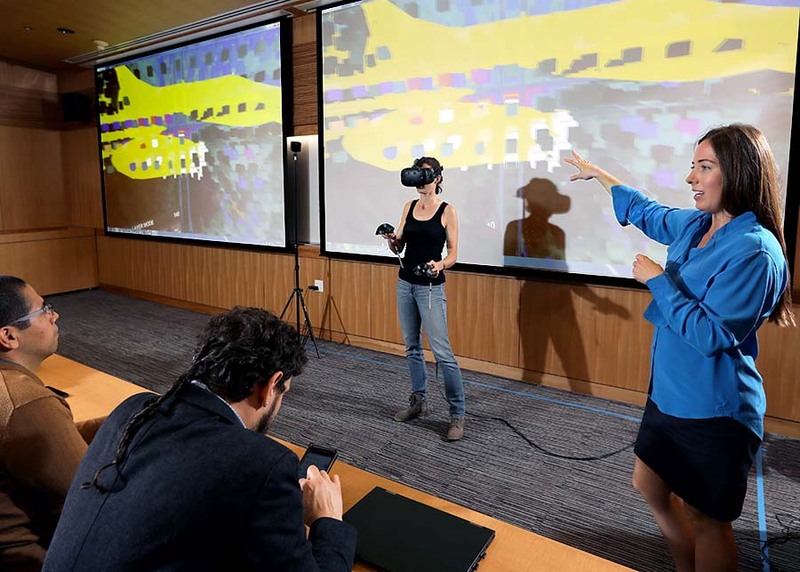 During the Sept. 28 symposium at the USC Health Sciences Campus, experts from various disciplines, including rehabilitation science, engineering and neuroscience, shared their latest work on projects applying virtual reality tech for health and rehabilitation. Those projects included multisensory feedback systems for people with Parkison’s disease relearning how to walk using VR environments; a platform for 3-D visualization — rather than the average 2-D computer screens in use today — for viewing neuroimaging data such as brain scans; and the “humans” used in clinical VR programs like those for assessing and treating military servicemember’s post-traumatic stress disorder. With eight featured talks, live demonstrations, a poster session and keynote lecture by Skip Rizzo, director for medical virtual reality at the USC Institute for Creative Technologies, the symposium showcased USC’s critical mass of talent in the ever-evolving field. “The breadth of expertise across our campuses puts USC in a unique position to do everything from hardware development to clinical trials within a single institution,” said James Finley, assistant professor at the USC Division of Biokinesiology and Physical Therapy. The symposium was hosted by the USC SensoriMotor Assessment and Rehabilitation Training in Virtual Reality, or “SMART-VR,” Center, a multidisciplinary center that works on virtual reality interventions for neurorehabilitation. The SMART-VR Center is a collaboration between faculty from the Division of Biokinesiology and Physical Therapy, the USC Chan Division of Occupational Science and Occupational Therapy and the Keck School of Medicine of USC’s Department of Neurology. “People are doing truly exceptional work across so many areas of health — across pain management, motor rehabilitation, aging and cognition and more,” said Sook-Lei Liew, assistant professor in the USC Chan Division and the USC Division of Biokinesiology and Physical Therapy, who, along with Finley, is a co-director of the SMART-VR Center. Liew is developing a brain–computer interface known as “Rehabilitation Environment Using the Integration of Neuromuscular-based Virtual Enhancements for Neural Training,” or “REINVENT,” for more efficient, customized rehabilitation after stroke, which is one of today’s leading causes of long-term adult disability.